"Oranges and blood oranges are combined with olives and a simple Mediterranean olive oil and lemon dressing for a perfect appetizer that checks the clean eating box." Slice a little piece off the top and bottom of each orange so you have a stable cutting surface. Trim away all skin and pith with a small sharp knife without taking too much off the fruit. 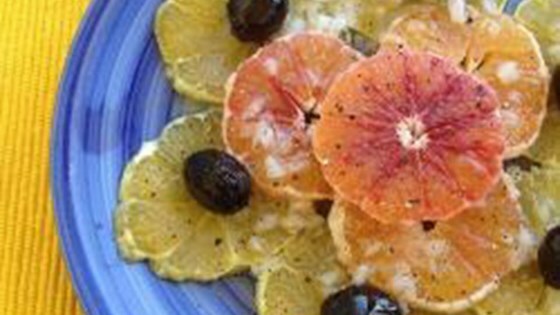 Slice oranges horizontally and arrange on a serving platter. Combine onion, olive oil, lemon juice, and salt in a bowl and pour over the oranges. Grind fresh pepper over the salad and arrange black olives on top. If not using dried olives, make sure you drain off as much brine as possible.